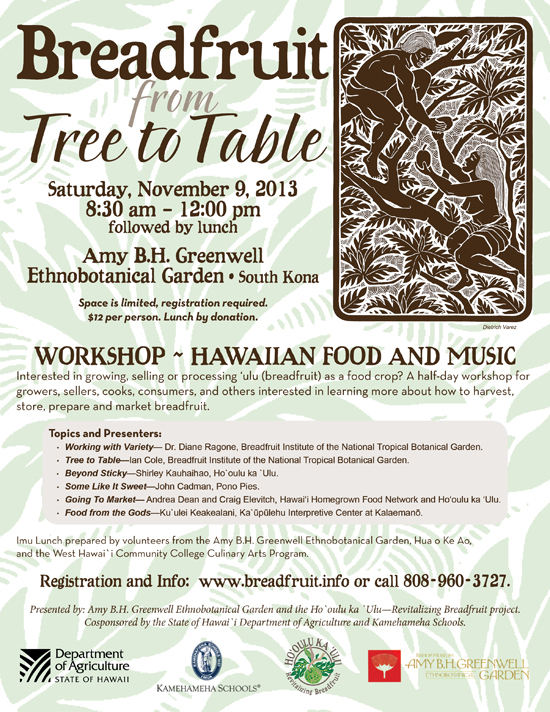 The Breadfruit — From Tree to Table workshop is set for 8:30 a.m.-1:30 p.m. Saturday, Nov. 9 at the Amy B.H. Greenwell Ethnobotanical Garden in South Kona. Sponsored by Kamehameha Schools and state Department of Agriculture, the half-day Breadfruit — From Tree to Table workshop will assist Hawaii’s breadfruit growers in supplying grocery stores, restaurants and farmers markets with high quality breadfruit, and help chefs become more familiar with breadfruit handling and preparation in the kitchen. Due to the sales and distribution of thousands of breadfruit trees in Hawaii, the production of breadfruit is expected to increase dramatically over the next few years — representing millions of dollars in potential retail sales of breadfruit in the next 5-8 years. Breadfruit can also play an increased key role in island food self-sufficiency, as it has been a primary staple food in the Pacific for thousands of years. The workshop teaches how to properly harvest, handle and utilize breadfruit to fully realize its commercial and community value. * “Some Like It Sweet” — making gourmet dishes from ripe breadfruit, presented by John Cadman, Pono Pies. * “Going To Market” — marketing and value added products, presented by Andrea Dean and Craig Elevitch, Hawaii Homegrown Food Network and Hooulu ka Ulu project. * “Food from the Gods” — Breadfruit and the cultural importance in the Pacific Islands, presented by Kuulei Keakealani, Educational Coordinator, Kaupulehu Interpretive Center at Kalaemano. The Breadfruit — From Tree to Table workshop will be followed by music and a locally grown lunch prepared by volunteers from the Amy B.H. Greenwell Ethnobotanical Garden, Hua o Ke Ao, and the West Hawaii Community College Culinary Arts Program. Breadfruit — From Tree to Table is presented by Amy B.H. Greenwell Ethnobotanical Garden and the Hooulu ka Ulu — Revitalizing Breadfruit project and is cosponsored by Kamehameha Schools and the state Department of Agriculture. Space is limited and advance registration is required. The workshop is $12 per person and lunch by donation. To volunteer at the workshop, to donate breadfruit or for general inquiries, email hooulu@hawaiihomegrown.net or call Andrea Dean at 960-3727.